1. Put the head of soap dispenser into the hole of the sink. 2. Screw the bottle to the head of dispenser from underneath, make it tight. 3. Fill soap liquid or hand washing liquid from top into soap dispenser. 4. Install the pump head, press down, then the soap dispenser is ready to use. 100% solid brass pump head, PP bottle, brushed nickel finished. Acid-resistance, corrosion-resistance. Includes a large capacity 320ML soap bottle that you can refill from the top. 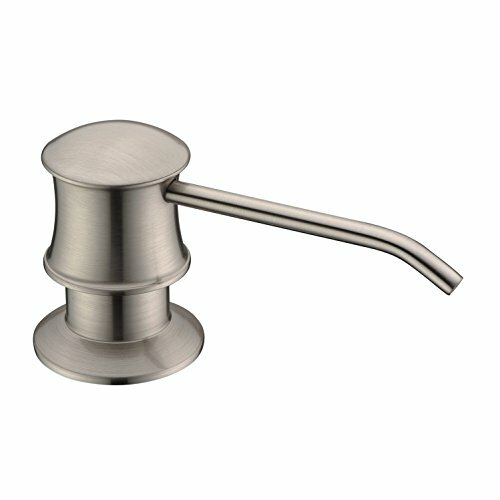 Perfect for Liquid soap, Lotion or Liquid detergent；Brushed Nickel sink soap dispenser matches a wide variety of premier faucet styles. Quality guarantee: Good quality and low price! If you have any questions about this product by GICASA, contact us by completing and submitting the form below. If you are looking for a specif part number, please include it with your message.